I was interviewed a couple of weeks ago on KSVR's Speak Up, Speak Out about work I'm doing at both the County and City of Anacortes. It’s 28 minutes, and more about procedure than policy. Councilmembers Brad Adams and Eric Johnson (who represent Wards 2 and 3) and I are hosting a community meeting at 6:30 pm on Thursday, December 5 in the library’s main meeting room. Everyone’s invited to come and share their thoughts, concerns, and ideas for the new year. See you then! How much should our mayor be paid? As the Skagit Valley Herald reported a while back, the City Council recently discussed a proposal to increase the mayor’s base salary from $103,663 to $110,000. I can’t imagine why we’re considering this during the “toughest budget year in 19 years,” but since the mayor has proposed it, let’s talk about it. First, Dean Maxwell is already the 13th highest paid mayor in the State of Washington as reported by both the Herald article above and this South Whidbey Record article from 2011. Second, the City of Anacortes is the only city in the state that has adopted a salary schedule for its mayor. This salary schedule increases the mayor’s salary 2.7% each year of his service up to year eight, so while Maxwell will make $103,663 this year, a new mayor would make only $85,993. Third, the salary schedule is already indexed to the national inflation rate, so the mayor already gets a yearly raise. The salary formula adopted by the City Council in ordinance 2708 gives the mayor a cost of living adjustment (COLA) equal to the Social Security COLA that is based on the national consumer price index. In the last few years, that increase has ranged from 0-5.8%. Additionally, although his salary is set by ordinance at $101,930 for 2012, Maxwell actually took home $105,360 in 2012, with additional pre-tax salary of $3,414 because he participates in the City’s dual insurance incentive program, where the City receives a health insurance premium rebate for the employee’s eligible dependent not using city insurance. That additional salary essentially did not cost the City money, but it was still additional cash the mayor received in his paycheck. The mayor of Anacortes is the chief executive of the city. He does not have separate responsibilities as city administrator or as “CEO of the water utility.” Anacortes already employs three other people with supervisory authority over our water utility: the Public Works director at $106,000/year, a water treatment plant manager at $95,000/year, and a water treatment plant supervisor at $83,000/year. Mayor Maxwell talks a lot about the fact that Anacortes is “unique” in that it operates a water utility. But many jurisdictions, in fact, operate water utilities, including our customers, Oak Harbor and La Conner. In Skagit County, Skagit PUD provides water and delivery to Mount Vernon, Burlington, and Sedro-Woolley. But elsewhere in the state, such as Snohomish County, there are many jurisdictions that both distribute water and operate their own supplies, including Everett, Marysville, Stanwood, Tulalip Reservation, Darrington, Snohomish, Sultan, Gold Bar, and Index. The City of Spokane, a charter mayor-council city with a budget of $160 million and 200,000 residents, operates not only a regional water utility (the third largest in the state) but also a hydroelectric utility. Spokane pays its mayor $100,008/year. Mayor Maxwell is fond of saying that Anacortes has a “strong mayor” form of government. But in fact, there’s no system of government called “strong mayor” by state law. There are essentially two standard systems that cities can choose from: mayor-council and council-manager. Anacortes has adopted the mayor-council form of government, where the mayor and councilmembers are elected by popular vote, the mayor is the sole executive, and the city council is the legislative body. The vast majority of Washington cities use the mayor-council form of government. Fewer than a fifth of Washington cities use the council-manager form, where the city council is popularly elected but hires a professional city manager to be the chief administrative officer. A mayor exists in the council-manager form of government, but is elected by the city council from among the members of the city council. There has been no discussion on the city council that Anacortes change to the council-manager system of government. There has been some discussion of creating a city administrator position, who would report to the mayor like all other employees. That would not be a change in the form of government at all. Some people argue that our mayor is doing the work of two people: mayor and city administrator, and so should be paid commensurate with the salary of a city administrator. But we are certainly not getting the value we would get if we had a separate city administrator position. The City Council can, and should, create a city administrator position to help the mayor manage the city, just as most other mayor-council cities have, including our neighbors Oak Harbor, Burlington, and Sedro-Woolley. Hiring a city administrator allows a mayor to focus on visioning, policy development, and political leadership. Such a city administrator could be a competitively-selected professional with experience outside of Anacortes that could improve the performance of our city government and help move some of our languishing projects forward. A city administrator wouldn't be a new concept for Anacortes. Although only the City Council can create a real city administrator position, the current mayor has over time properly delegated much city administration to his department heads. Several city employees I’ve spoken with regard the Public Works director and Human Resources director as de facto city administrators. The previous city attorney/planning director was often referred to, at least by outside observers, as city administrator. It’s time to formalize that position, require Council confirmation, and professionalize the way the City does business. How Should We Set a Mayor’s Salary? Serve at-will and are accountable to, and can be fired by, their boards of directors. As low as possible to conserve the city’s tax dollars. Evaluating those factors, I see no reason to increase the salary. The salary for a new mayor under our current schedule, $85,993, is enough to attract three new candidates for mayor this year, each qualified to assume the office. That salary is also enough for a single-income person to live comfortably in Anacortes. In fact, if we are to make any changes to the mayor’s salary, it ought to be to adopt a single figure (probably $85-95k per year) eliminating the salary schedule that provides bonuses for longevity, and continue to index it to inflation (properly using the U.S. City Average CPI-W). That would allow us to save more than $60,000 over the mayor’s current salary over the next four years, which we can use for other more important things. We would also save that money if voters elect a new mayor this year. Tonight’s agenda requested approval for three contracts that were not included in the packet, including one for divers to remove milfoil from Heart Lake. When I asked that it be reviewed by the City Attorney before approval, Mayor Maxwell protested that he was responsible for the attorney review and that we didn't need to worry about it. The Mayor is wrong, of course. RCW 35A.11.010gives the City Council authority to enter the City into contracts, and that plainly includes the responsibility to ensure those contracts protect the City from needless liability and to ask for city attorney review. Most of the time, when we’re asked to approve a contract award, we’re not shown the text of the contract. But frankly, it ought to be obvious to every councilmember that we shouldn’t approve contracts we haven’t been given. There is no reason we should be expected to trust that the mayor’s administration is handling contracts correctly. This point was driven home for me in March when we did see a contract with the Parks Foundation where the scope included work by volunteers over the water at the Ship Harbor Interpretive Preserve. The one-page agreement, which the City Attorney had not seen, did not contain a period of performance, termination date, detail on billing or payment, specificity in the work to be performed, or liability, insurance, or indemnification provisions. I asked for these standard provisions to be added to the contract, but Councilmember Geer moved to approve it as-is. I voted no. More recently, the Council approved a resolution for a $10,000 tourism contract. The last line of the resolution said a copy of the contract was attached; it wasn’t. The resolution was for a $10,000 contract, but the proposal that the contract was supposedly funding had a $25,000 scope of work. Staff were not able to answer my questions about what the contract’s scope of work would contain. The biggest issue in this year’s election is the Tethys contract from three years ago, where the City approved a long-term agreement to sell off 5 million gallons of water per day. Negotiations were in secret, and not even city councilmembers knew of the contract before it was presented for approval. (That was markedly different from how the City of Everett treated its Tethys contract negotiations, with in-public city council discussions with their legal staff.) That contract was so expertly-negotiated that Tethys was able to lock up 5 million gallons of Anacortes water per day, that we’re not able to sell to anyone else, without paying a dime for it over the last three years. And now the City is repeating that sorry chain of events by needlessly concealing the fact that we’re preparing to contract with the Samish Tribe to provide municipal services to their future casino. The City Council has received no public briefings on the draft agreement, and had no opportunity to vet that agreement with the public. After tonight’s meeting, Councilmember Bill Turner angrily asserted to me that other city councils don’t get to see their contracts either. While I’m sure that’s what the mayor has told him, it’s also not true. Here are links to the meeting packets for the Oak Harbor and Sedro-Woolley city councils. Each packet includes the text of the contracts on the agenda. Their mayors don’t ask their city councils to approve contracts they haven’t seen. We ought to have standardized agreements written in plain language, approved by the city attorney, with each scope of work reviewed before it is submitted to the City Council for final approval. These are obvious reforms that a professional city administrator would implement immediately. But until that happens, if our city councilmembers are interested in doing their jobs, they need to start refusing to approve contracts they haven’t been given. Photo by Alex Mahan — CC By-NC-SA 2.0. Many Anacortes residents—along with friends and tourists from all over—will enjoy a respite from the rising temperatures this week in the lakes in our community forestlands and elsewhere on Fidalgo Island. 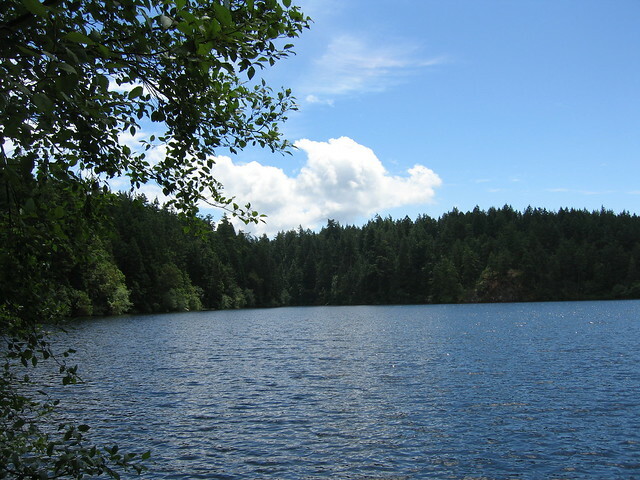 But on Tuesday, a 28-year-old man drowned at Whistle Lake. As this recent Slate article points out, drowning doesn’t look like the drowning you see on TV. Be extra vigilant, and watch out for your friends and others. Got an idea to promote tourism? Each year, City solicits proposals from local non-profit organizations for “activities designed to advertise, publicize, or distribute information or other activities specifically authorized for the purpose of attracting visitors to our community.” Completed applications are due by September 2, 2013. If you have questions contact Carol Yates at 360-293-1912 or carol@cityofanacortes.org. The grant recipient must match the grant amount with at least 25% of its own funds. Over the past 18 months, the City of Anacortes has been negotiating an agreement with the Samish Indian Nation to provide municipal services (e.g., police, fire, water, and sewer services) to a future Samish casino at the intersection of Highway 20 and Thompson Road. Earlier this month, the mayor sent a letter to the tribe’s chairman noting the ongoing negotiations. Although this property is currently within the city limits (where the City is obligated to provide services even without a contract), the Samish Tribe is working to convert their property to federal trust land, which would remove it from the City’s jurisdiction. Because the process for conversion to federal trust land is a lengthy one, the Samish Tribe has requested in the meantime a change to the City’s development regulations to allow a gas station with attached convenience store or attached drive-up food or beverage service in the LM1 zone, consistent with other uses that already exist in the same zone. The City Council docketed the Tribe’s request on Monday and will process it along with other comprehensive plan amendments over the next year. The Samish are simultaneously, but separately, working with Congressman Larsen to obtain Congressional legislation to convert several of their other properties in Skagit and San Juan counties to trust land. These properties could not be used for gaming due to a provision in the legislation prohibiting it. Thanks to Time Magazine, you can watch an animation of Anacortes's growth in the last three decades. Go to Time's Timelapse viewer, make sure your browser is full screen, then click “Explore the World” and type in 98221 in the search in the lower right corner. HT: Cynthia Richardson. Here are our census figures over the same period. Note that some annexations occurred during these periods that may skew growth rates. Source; source. Sign up for Green Power! For as little as $4 per month, you can get your electricity sourced from renewable energy sources like wind, biogas, and sun—including some right here in Skagit County. Learn more and sign up online at PSE’s Green Power website. Puget Sound Energy is challenging five Western Washington cities to get 15% more of their citizens signed up for Green Power. So far, Anacortes is lagging behind! If we get 15% more electricity users signed up for Green Power—just 85 residents—we’ll win a $20,000 solar array for the city. If we get the highest percentage of all five cities, we’ll get a bonus $20,000. Help us out! If you already are a Green Power customer, boost your participation level to add to our recruitment total. You’ll also be entered to win a $10,000 solar system for yourself. Isn’t the Northwest already powered by renewables? Not exactly. Although much of Washington’s power is generated by hydroelectric facilities, we’re part of a multistate grid that includes many other states with much less cleaner energy sources. Since electricity is sold to wherever there’s demand, decreasing our overall demand and increasing our renewables mix here in Washington can help offset the demand for dirtier energy elsewhere. Have you seen the proposed R Avenue roundabout? The City Council recently approved a $65,000 contract for 30% design work on the project. This is a high accident location due to: the width of R Avenue; traffic volumes; and limited sight distance. A roundabout will decrease accidents and allow for safer merging from side traffic. The project has been in the City Capital Facilities Plan since 2008. It is also a key part of our long term planning for the R Avenue Corridor which shows left turns onto R Avenue only being allowed at safe locations along R Avenue at 22nd Street and 30th Street. The roundabout design will include pedestrian improvements, which will be later complemented by additional crosswalks across R Ave. Those crosswalks (which came up at my last Ward 1 public meeting) are important, especially for bus riders who are dropped off on the east side of R and have to cross to residences on the west side. Send comments to City Public Works Engineering staff or click “Comments” below to add to this post.